Taptap gives you access in a wink! 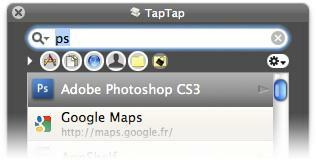 You can access TapTap from anywhere, whatever the current application or your activity on your Mac. TapTap is always available and you simply activate it via the keyboard or in combination with the mouse position. This menu gives access to extra features (Copy, Reveal, open the browser, etc..). Open / launch the selected item by pressing the Return key or use the contextual menu for browsing or the menu for additional operations on items matching your entry. Contextual menu to access and browse the folders contents. Use abbreviations for quick access to your applications or data. For example, add "ps" in the description of Photoshop to quickly and easily access it. 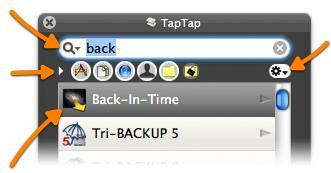 Use the contextual menu to access the contents of your favorite folders and navigate easily within your disks. Note: The contextual menu is available by clicking on the folder with the Control key pressed (or with a right click, or clicking directly on the right side of the row). TapTap Menu in the menu bar: Click in the center of the menu bar with the Control key pressed to access a menu with the files and folders you defined. The menu lets you browse inside the folders, and open the selected item. TapTap Shortcuts for Direct Access: You can assign shortcuts to specific applications, files and folders to open them with the shortcut without needing to open the access search window. TapTap and Address Book: TapTap searches and displays the contents of the Address Book entries. 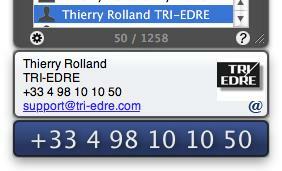 When available, the image of the entry is displayed, and the phone number in a large and visible font. You can also use a shortcut to create an email.